ARKit is Apple's official entry in the world of augmented reality, and it's easy to read it as a big play to create an ecosystem for, when the time is right, its long-rumoured pair of AR smartglasses. Thus far, one of the big apps that have punched through on social media is Ikea Place, which allows you to quickly and easily see whether Ikea furniture will work in your home. It also happens to be quite a lot of fun. People have noticed, and they've taken to Twitter and Facebook to show off weird things they've done with the app. Like, you know, filling your small room with a whole bunch of lamps. Or turning a subway platform into a chic rest stop. But this is Ikea. It's a company that makes labyrinths disguised as retail stores, with restaurants so good that some people go just for the food. It makes furniture that tests the strength of relationships and punishes those who feel like they're too good for instructions. How did it suddenly become one of the biggest names in augmented reality? Ikea's fascination with augmented reality started well before what you might consider the "new wave" of AR. Back in 2013, the company discovered that 14% of its customers end up taking home furniture that was the wrong size or look for their home. Augmented reality was an interesting and viable solution to the problem. It worked like this: You placed your 2014 Ikea catalogue on the ground and point a smartphone at it. Out of the catalogue would emerge some furniture, allowing you to see what it would look like in your living room. The idea was simple, and a little bit genius. The app's functionality was limited and actually using AR was a bit of a chore. You not only needed the app, you also needed the physical catalogue to do anything. This system also relied on Ikea scanning in products from the catalogue, which means that if it announced new products that didn't make it in, you'd probably have to wait. Checking out how furniture looked in your home wasn't the only thing Ikea tried to sell. As you can see from the promotional video, it also tried really hard to make its app seem fun to use. It was a good effort, but it was also clear the technology just wasn't there to provide an experience people would want to keep coming back to. That changed this year when Apple announced ARKit. No matter what you think of Apple, when it announces something, people pay attention. Even better when what it announces happens to be good, like ARKit, which to us already feels like one of the more solid and impressive AR platforms out there. The quality of the augmented reality is impressive, which in turn helps developers create better, higher quality augmented reality experiences. And that's pretty much what happened with Ikea Place. Michael Valdsgaard, Ikea's leader of digital transformation, says that the company immediately launched into putting together a new app. "All of a sudden there is this new technology that's maturing, and it can do things that we have been dreaming about since we founded the company almost". Ikea learned some valuable lessons from its original AR app. It's built for the more comfortable portrait mode, the way most people take video with their phone. It's got a conversational interface rather than throwing menus at you. You just point it at the ground and can start plopping down virtual furniture. A large part of that simplified interface is due to Ikea not having to worry about the underlying technology as much. "ARKit solved some technical issues that nobody else has solved," Valdsgaard says. "That makes placing the object very easy and it locks into position and you don't have to do things beforehand other than pointing your camera towards the floor. And when that happens it tracks the floor, takes the plane and understands where it is in the room and the dimensions and so forth." Plus, Ikea can consistently add items to the app, though right now it's prioritising items that work on a horizontal plane (due to ARKit limitations) and big-ticket furniture. Expensive, and large, pieces of furniture are the things people mull over the most, and the things they most regret purchasing when they get it wrong. Ikea initially planned on having only 500 items available in the app, but quickly ballooned that number up to 2,000, with plans to continually add more as fast as possible. Ikea's idea is a practical solution to a problem all homeowners face, but it's also a very clever marketing tool. "It's likely the cost of building the app will have already been saved in reduced marketing costs and the ROI will continue with better conversion and engagement," says Piers Harding-Rolls, AR/VR research coordinator at IHS Markit. Stacking virtual sofas on subway platforms might be fun for you, but sharing that with others is going to create buzz, and suddenly you've got a viral way to get people to download your app. But it's not just Ikea that's looking to take advantage of AR to help its business. Harding-Rolls points out that both furniture and beauty companies have been looking at augmented reality for a while because of its ability to smooth out the buying process, increase purchases and reduce return rates. These industries currently rely on people coming to physical store and trying things out. This is why a company like Sephora takes so much time making sure its customers find the right fit, handing them free samples to try in-store. If the customer gets it wrong, they'll return it and Sephora will have to throw the product out. ModiFace, an augmented reality startup, is one of the current trailblazers in using augmented reality to change shopping. Jennifer Tiddy, VP of partnerships at ModiFace, tells Wareable it's been working in AR for the past 10 years. It counts Estée Lauder and Sephora as brands within its portfolio of AR apps, which allow customers to try on makeup and eyeliner at home on their phone's front-facing camera. ModiFace is also one of the few companies that grabbed ARKit attention during the summer, with a demo showing how the technology could be used to preview hair dye. If you didn't know it was a demo, you'd probably think it was just a video of a woman comparing hair colours. "The time spent in-store and online will increase, therefore so will conversions," says Tiddy. Fewer people returning items means more profit, especially for companies like Ikea. But while the Swedish home giant might have the buzz and the mindshare for now, that might not be the case in the future. AR is going to be a standard feature in the world of home furnishing, believes Harding-Rolls, and not having it could be a "negative differentiator." A cursory look at the App Store proves him right. Home furnishing apps are popping up in the App Store every day: Build, Overstock, Anthropologie, and Houzz are just some of the other companies with home furnishing departments that are jumping into AR. Even companies like Edmunds, which uses ARKit to allow you to put a life-sized car in your garage to see if it fits and/or looks good, are getting in on the action. For comparison, things are a little different in the beauty sphere. Most of those companies are turning to ModiFace to provide the technology. And ModiFace doesn't see glasses as the future for its AR implementations. "Glasses are great for AR games but for what we do, mirrors are the best solution," Tiddy explains. What we're soon going to see is an AR arms race; all these companies competing against each other to make it easier and easier to see what works best on your face and in your home. And all of this will eventually move to the smart glasses we'll one day don on our faces. Ikea wants to keep on this AR train and see where it goes. "This is just the beginning, not the end," Valdsgaard says. Ikea is planning an offline mode that'll allow you to scan your place and modify it on the go. Right now, your furniture-planning needs require you to be in the space you want to enhance with some new duds. Say you had a bolt of inspiration while staring at the ceiling at the office, or on the train to work – well, you'll soon be able to test it out. And of course, you'd be able to share it with friends and family to get their thoughts and feelings on the matter. But most interesting is how Ikea has delivered one of the best mainstream examples of AR so far – by giving people something they've wanted for so long. The threat of Amazon looms large, and the AR wars are just heating up, but as with smart lighting and wireless charging, Ikea has proven again that it's mindful of big technology trends. 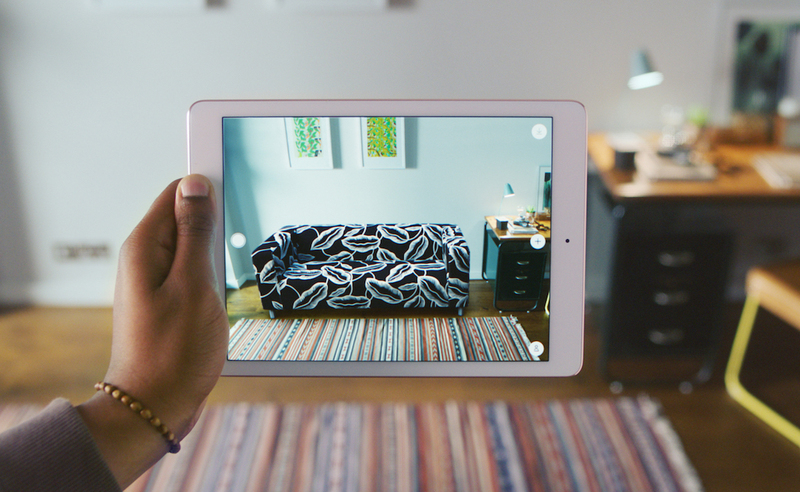 With AR, Ikea isn't changing lives, but it's making them a hell of a lot easier.